(L-R) Angelo Lahoz, Senior Vice President, Technological Institute of the Philippines; PhilipGioca, Country Manager, JobStreet.com Philippines; Dr. Elizabeth Quirino-Lahoz, President,Technological Institute of the Philippines; Ma. Corazon Halili-Dichosa, Executive Director, Board ofInvestments; Tetsuya Yamada, Senor Representative, Japan International Cooperation Agency (JICA)Philippines. 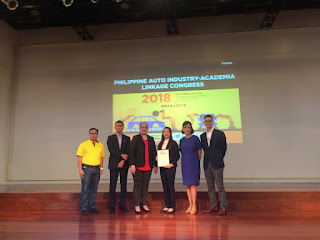 The 1 st Philippine Auto Industry-Academia Linkage (PAAL) Congress gets a head start on preparing the country’s future auto industry professionals and technology experts. (L-R) Philip Gioca, Country Manager, JobStreet.com Philippines; Tetsuya Yamada, Senor Representative, Japan International Cooperation Agency (JICA) Philippines; Ma. Corazon Halili-Dichosa, Executive Director, Board of Investments; Marcelino Yu, Trustee, Philippine Die and Mold Association (PDMA); Rene Dela Cruz, Board of Trustee, PMDA; Engr. Jennifer Angeles David, Factory Manager, SIIX EMS Philippines; Engr. Almira Ruiz Comuyog, Quality Assurance Division Manager, DENSO Philippines Corporation; Sherwin Chan Nones, Head of Strategic Planning and Marketing, Integrated Micro-electronics Inc.; Dr. Elizabeth Quirino-Lahoz; and Angelo Lahoz, President and Senior Vice President, respectively, of Technological Institute of the Philippines.